The Twelfth Night celebration is barely over and the traditional pancake is now a memory. 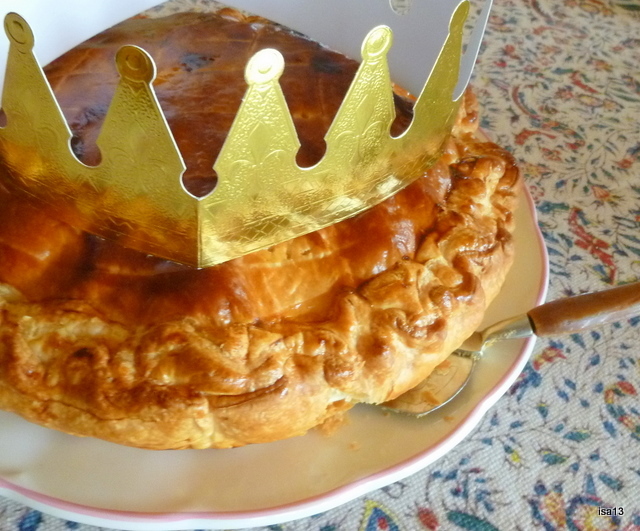 It is usually baked with ground almonds, butter, eggs, sugar and flaky pastry. Sadly, this year I forgot the main attraction: the hidden lucky charm! Five pairs of questioning eyes looked around the table wondering who had swallowed it… I confessed forgetting to put the tiny china king inside the cake before baking it. “Oh well, we enjoyed the cake anyway” was the main reaction. 2 0 1 2 is on its way indeed and I sincerely wish you a good health in a Happy, Peaceful and Hope-filled New Year. The family holidays spent up in the Alps were very enjoyable. A lot of snow fell before Christmas. Skiers were overjoyed, drivers a little less and I was delighted since I mostly walk along mountain paths, skiing is no longer on my programme. 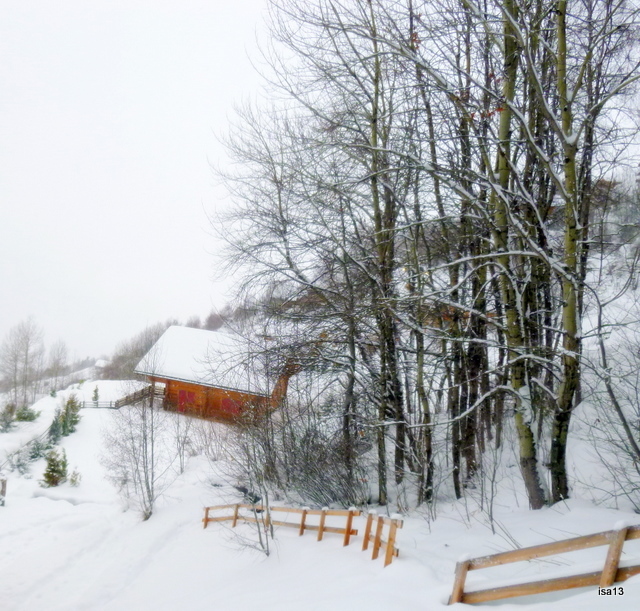 The tracks are so peaceful during Winter contrary to the slopes which are very busy with skiers and snowboarders. These narrow paths are far less visited than in Summertime. Sometimes you might meet another hiker, a few people going snowshoeing or a hare, appearing and disappearing like a white flash. Depending on the temperatures, some bees hibernate in a hole in the ground from October till April. Another kind of bees winter inside their beehives; the swarm gathers near their supply of honey and with carefully measured flutter they create their own heating. Very clever and precious little insects. Other kinds of animals will not even dream of hibernating, never even heard about it ! 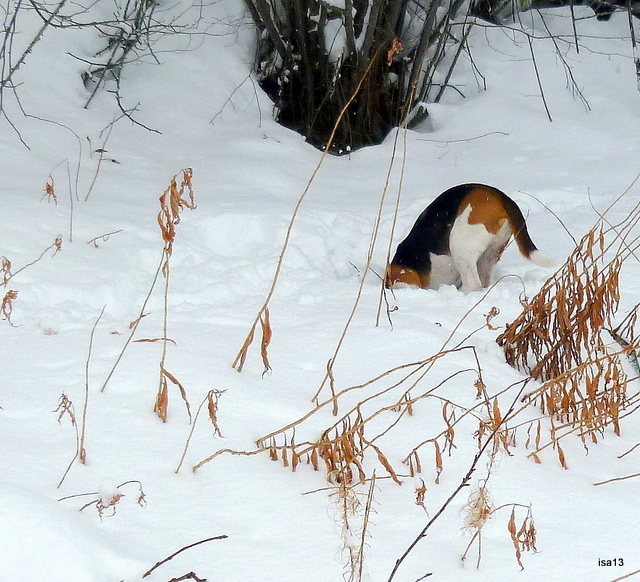 Like this tireless and curious beagle, my Nino, persisting in his continuous investigations no matter the Season and temperature. Reading, as you know, is very much part of my activities. 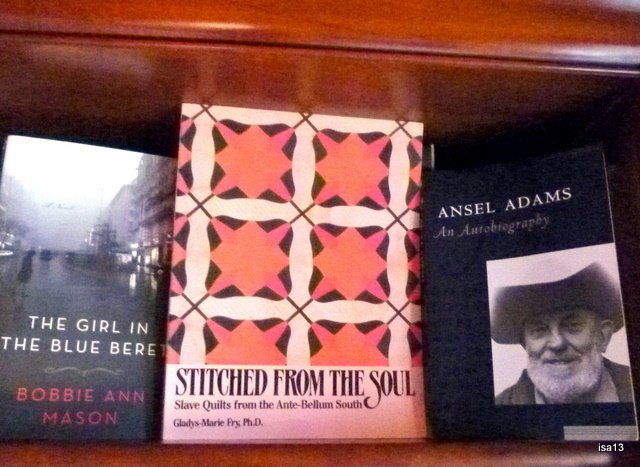 I received two books : “The Girl in the Blue Beret” by Bobbie Ann Mason. I have not started it yet but am looking forward to doing so soon. “Stitches from the Soul”, Slave Quilts from the Ante-Bellum South, by Gladys-Marie Fry, Ph.D. A fascinating and moving reading through history and quilting. Most of all it is about “the roles and contributions of slave women to plantation life that had been swept under the rug of history”. (G.-M. Fry). This is certainly one of my most precious books on quilting. The third book under the Christmas Tree was a “pre-Christmas gift” I offered myself. Not really planned but all the more appreciated. One day last December I went into a thrift-shop hoping to find a lamp for my sewing table. I came out with “Ansel Adams’ An Autobiography”. I am asking you : “Which of you, friends of photography, could have resisted buying this wonderful and rare book ?” I have always admired Ansel Adams’ pictures of nature, B&W treasures I could look at endlessly and just wonder. And now Ansel Adams’ autobiography is in my hands and I am enjoying every page of it ! Indeed I am grateful for this piece of luck I found between ancient chinaware and used, certainly much loved wooden toys. for, for, for so much more ! Have you ever tried writing your liste of people, things, moments, places, music, food, etc. you are grateful for ? There is a lot to learn about oneself, I think. Thanks to marah for suggesting this “List of 100 Things that give you life, the things that matter”.